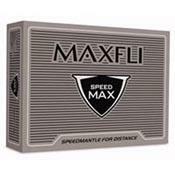 The Maxfli SpeedMAX golf ball is a three-piece ball that incorporates four critical elements that work together to fuel its performance, and they are the cover, the mantle – known as SpeedMantle – the core, and the 442-dimple pattern. The Maxfli SpeedMAX has above-average ball speed thanks chiefly to the development of the SpeedMantle, a thin layer sandwiched between the cover and the core. The SpeedMantle is comprised of HPF 1000, a material created by DuPont that is soft yet extraordinarily resilient and faster than a conventional polybutadiene core.